Time for a mini geography lesson. Florida is in the South. And we all know what that means. 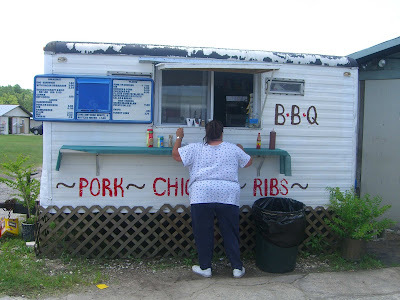 The food is so good down here, SO good, and so comforting and so homey and so filled with love, that you literally have no control over your waistline. Come down here looking like Angelina, you'll leave looking like that lady in the photo sidling up to the BBQ cart! Thankfully I haven’t hit that level. Yet. But I do suppose it’s only a matter of time. Our budget is so tight that I’ve been making almost every meal at home lately, and I think that has been my saving grace. I crave diversity when I cook at home, so our table has been overflowing with all sorts of crazy ethnic dishes inspired by Indian and Javanese and Chinese and Caribbean and Mexican and Argentine and Peruvian cuisines. So, when Phil’s birthday rolled around in June, I told him he could literally have ANY dinner he wanted, from ANYWHERE in the world. And you know what he wanted? 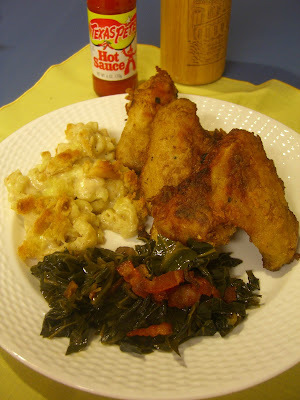 Fried chicken, mac ‘n’ cheese, collards, and cornbread. What a good Southern boy. Now let me tell you I was quite nervous about this meal. 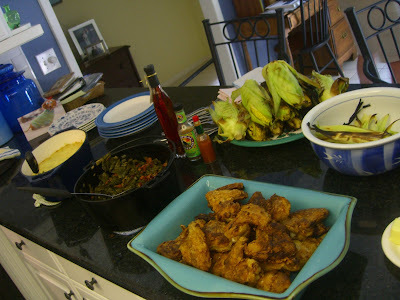 I planned on cooking Southern classics for fifteen of Phil’s friends, who all grew up in the South, and who all had grandmas with generations-old recipes for these dishes. People can be quite opinionated about what they believe constitutes the perfect fried chicken or collards, and I worried that I would fail miserably at pleasing the crew. So, I decided to do a test run of the dinner a few weeks before Phil’s birthday. 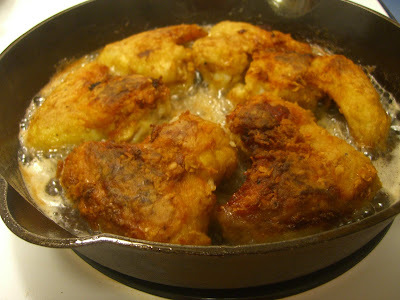 A recipe for fried chicken I have come to trust is one brought to my attention by Ruth Reichl in one of her books. I had made Claritha’s Fried Chicken Wings a few times in the past and they were always moist from the dry-brining and buttermilk marinade, slightly tinted with an oniony flavor, and nicely crusted from the double-battering process. I used Vidalia onions instead of regular brown onions in the marinade to lend a sweeter note, and I also threw in some chicken legs to give both a white and a dark meat option (the recipe only uses chicken wings). I also seasoned the flour for dredging more heavily than recommended with cracked black pepper and cayenne, and added in some adobo (a Puerto Rican seasoning mixture of salt, garlic powder, oregano, and turmeric). A heavy, well-seasoned cast iron skillet is absolutely essential in maintaining a consistent frying temperature. Yum! These are even excellent cold the next day, if you have any left over! I also made a skillet cornbread. 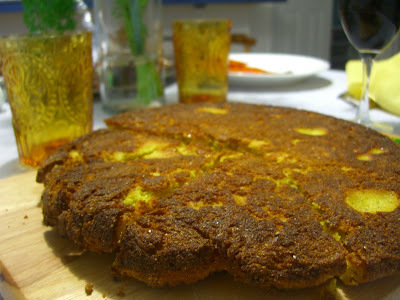 Southern cornbreads are much different from their northern counterparts, and having lived up north most of my life I’m used to the sweet, thick, moist cornbreads you get in Ohio or New England. But in the South, little to no sugar is used and the bread is at its best when the batter is poured into a hot cast iron skillet so it can achieve a contrast of textures, with a crusty brown exterior and a creamy interior. I used a recipe for Iron Skillet Corn Bread from Jean Anderson’s A Love Affair with Southern Cooking and it was divine hot from the oven. However, unlike that moist cornbread from up north that only gets better as it sits for a few days, this Southern version wasn’t nearly as tasty the next day. For this practice run of Phil’s Southern birthday dinner I also made my favorite Martha Stewart macaroni and cheese. 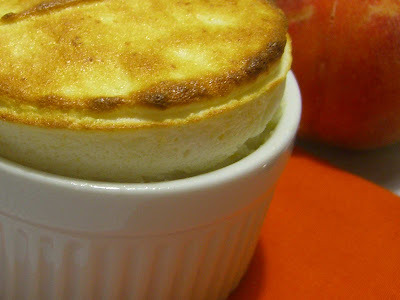 This recipe never fails and is one of my all-time favorites! It didn’t disappoint, but I wasn’t sure it fit in perfectly with such a traditionally Southern meal. When I’d had mac ‘n’ cheese in restaurants or in friends’ houses down here, those versions never had a crispy crouton topping and they weren’t normally as creamy as Martha’s recipe. Thankfully I visited my good friend Ang in Charleston the day before the big dinner, and she pointed me to a mac ‘n’ cheese recipe in The Lee Bros. Southern Cookbook that perfectly complemented the other dishes. Remove the large woody stems from the collards and cut them into 3/4 inch strips. Clean collards thoroughly by floating them in a large bowl of water or in the kitchen sink, allowing the dirt to sink to the bottom of the bowl. Cook the bacon over medium-high heat in a cast iron or other heavy-bottomed pot until fat is rendered and bacon is crisp. Remove bacon with a slotted spoon to a plate, leaving drippings in pot. Add onions to the kettle and cook, stirring occasionally, until well browned and caramelized, about 10 minutes. Remove the onions with a slotted spoon and reserve in a bowl. Place the chicken broth, vinegar, sugar, and half of the bacon into the pot and stir until sugar is dissolved. Add the collards to the liquid. You might have to do this in two batches, waiting for the first batch to wilt and make room for the other half of the greens. Stir the greens and make sure they are covered in pot likker (the broth), then cover the kettle, turn the heat to medium low, and simmer for about an hour and a half, checking the greens and stirring them occasionally. 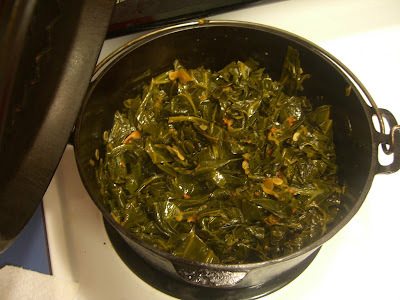 After an hour and a half of simmering, add the onions back to the collards, season them with salt and pepper, cover the kettle, and cook for another 30 minutes to an hour, until the greens are tender but not mushy. At this point, taste the greens and add more vinegar, sugar, salt and pepper to get them just like you like. Top the greens with the rest of the crispy bacon and serve. sounds really good. but i'm always battling the weight and have been wondering how you manage to enjoy all that well-prepared food and remain slender! i'll be cooking more when the kids get back in school. for now we are living easy and on the fly!